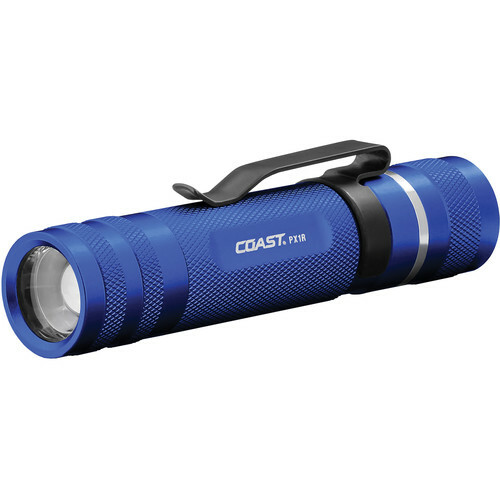 Designed for power, versatility, and convenience, the COAST PX1R Pure Beam Focusing Rechargeable LED Flashlight offers a low output for tasks such as reading and a high output to light larger areas, with the capability of running on both disposable and rechargeable battery chemistries. For even more usability, the light is outfitted with a focusing system that allows you to focus the beam from a wide flood for close-up work to a spotlight for a further throw distance when you need it. The beam focuses by simply twisting the head. Its flood beam is smooth with consistent brightness from one edge to the other without a hotspot, and when focused it produces COAST's "Bull's-Eye" Beam, which has a bright center circle that smoothly transitions to a dimmer "halo" around it, providing maximum illumination precisely where you need it with plenty of spill to keep you aware of your surroundings. Its two outputs are controlled by a simple on/off push-button switch on the tailcap. The light is capable of running on dual battery chemistries, and COAST provides both to get you started. First, you have a lithium-ion rechargeable battery pack that can be charged in or out of the light using the included USB cable and the included 110 VAC wall outlet adapter. If you run out of power and still need a light, you can use three AAA batteries. Outputs will be a bit lower and runtimes are different...but at least you won't be left in the dark.